Residents near affected area outraged saying they have been robbed of their livelihood. The Minister for Environment and the Ministry of Fisher­ies are warning people not to eat fish or swim near the site of a chemical spill at Malau in Labasa. The incident at Malau Port hap­pened two weeks ago and was iden­tified by the Department of Envi­ronment as Tanalith. Tanalith is a chemical used by the Fiji Forest Industries at Malau to treat sawn timber. It was stored in a tank that had ruptured, according to the department. They are now investigating the cause of the spill. Attempts to get a comment from Fiji Forest Industries general man­ager operations Stephen Clark be­fore this edition went to press were not successful. Minister for Local, Government, Housing and Environment Parveen Bala said a co-ordinated approach had been taken by three agencies – Ministry of Environment, National Fire Authority and Maritime Safe­ty Authority of Fiji – to mitigate the spillage. 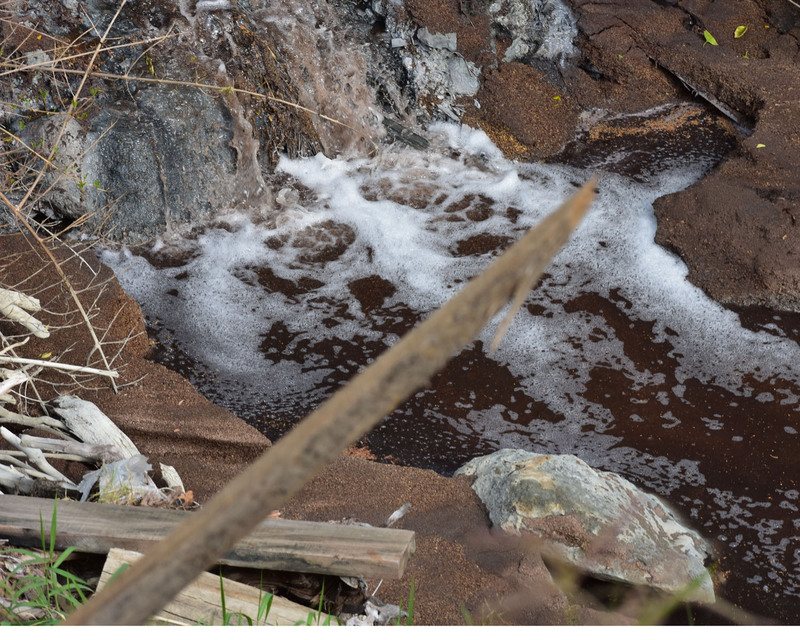 “Immediate remedial work report­ed (apart from containing the spill) to have been undertaken included the deposit of sawdust in the con­taminated area, which was used to soak up contaminated water,” he said. “It was unclear how far the chemi­cal had spread but people should avoid fishing or entering the water on the coast near Malau. “Spilt chemical was pumped into glue containers and preventive measures ordered include increase of the Bund height, which holds the chemical tanks to prevent incidents from reoccurring. “It is understood that a stop-work notice was issued by the ministry and a remedial notice under Sec­tion 38(1) of the Environment Man­agement Act,” he said. The ministry’s Permanent Secre­tary, Joshua Wycliffe, told Fiji Sun that FFI had reported a burst from its tanalith storage tanks, which spilt into the surrounding environ­ment of the facility. Mr Wycliffe said the distance from the sea to where the chemical tank ruptured was about 200 metres. Considered as a toxic chemical to aquatic organisms Tanalith could have long lasting effects on the ma­rine ecosystem. The chemical product a mix of chromium, copper, and arsenic, should not be allowed to enter drains, watercourses or the soil. Fisheries director Aisake Batiba­saga said people needed to be wary of seafood harvested in the Malau area after the spill incident. Wildlife Conservation Society Fiji director Sangeeta Mangubhai de­clined to comment on the issue be­cause she did not have the facts of the incident, adding it was not her field of expertise. The incident has left many in the area frustrated, like Josefa Poe who lives in Vuo Village. He said they have been robbed of their source of income. “I feel that people in the area should have been informed because they used waters in the area for sus­tenance,” he said. He said four weeks ago, people were using nets to fish along the Malau coastline. “Today, we can no longer fish at Malau. I sell the fish I catch at the Labasa Market as a source of in­come for the family,” he said. Luke Vugonisa said fish and other marine life were found dead along the shores because of the spill. “Our children swim in the area; now we are taking extra precaution because we have been told that the chemicals in the sea could burn our bodies,” he said. “We had received a report from Fiji Forest Industries (FFI) that one of its Tanalith storage tanks had burst and that this chemical had spilled onto the surrounding envi­ronment at the facility. Mr Vuganisa is urging the author­ities to act quickly in addressing the spillage.